Product Description: This shifter fits on top of the 700 R4 transmission and includes the shift handle, shift knob, neutral safety switch hook-up, shift connection to the transmission, with a Park, Neutral, Reverse, Overdrive, Drive, 2 and 1 gear selection. 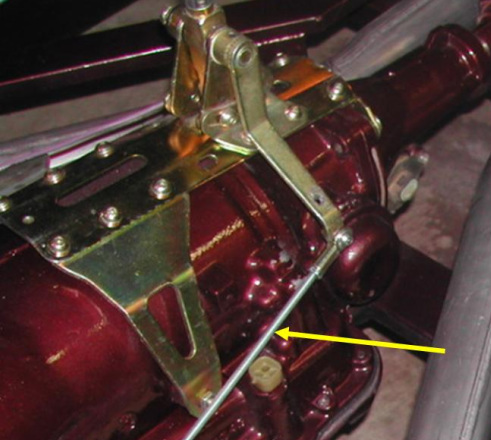 The yellow arrow to the left shows the shift rod which mechanically operates the shift lever going into the transmission. The entire shift mechanism is bolted to the sides of the transmission. Note that this part needs to be installed before the body has been placed on the frame. This is to determine the exact position the shift lever fits through the floor. Also, make sure the shift rod does not bind up against any part of the floor panels when installed.